Cruise reunions have many advantages over land-based reunions. The wide range of activities allows something for every age and taste. You don’t have to plan all of the entertainment nor hear complaints from those who don’t like their choices. Limited vacation time doesn’t force the choice between visiting family or taking a vacation — you can do both. Kids’ programs allow adult time as well as time to be together with the whole gang. Joan Larsen of getgonecruises.com, says people sometimes balk at the price of cruises. But if you look at the cost of a land vacation — hotel rooms, meals, daycare, entertainment, you’d find cruises comparable, or even a deal. Trying to mesh everyone’s schedule always takes longer than you’d guess. At least nine months to a year in advance gets the best pricing. Your travel agent can split payments to make it more affordable. And most cruise lines allow you to “block” public rooms for private family functions based upon availability. 2. Designate one person in charge. Ideally, the person in charge will be organized, enthusiastic, energetic and get along with everyone in the family. Or you could fall back on plan B: the person in charge is whoever is willing to do it. 3. Chose cruise line carefully. Cruise lines have “personalities” and the most successful cruise reunions match the personality of the cruise with the personality of the group. Cruise specialist travel agents are invaluable in helping determine which cruise line is best for your reunion. If you like Vegas, you’ll like Carnival. If you have small children, Carnival is also a good choice, because they have one of the best baby and toddler programs. Some longer Carnival cruises have ports of call families prefer. If your group has ages from kids to grandparents, you might prefer Royal Caribbean or Disney that attract families and offer good programs for kids and teens. A more mature group might want something less raucous and classier like Holland America or Celebrity. And if you are looking for top-flight luxury and money is not an issue you’ll love Crystal. If there are school-age kids, you’ll probably want to book during school breaks. If you don’t have many kids, avoid school holidays. 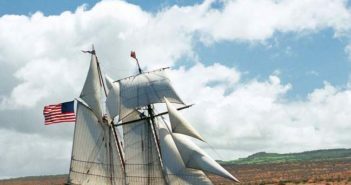 Christmas break or Easter week ships are pretty full and it may be harder to get discounts or book rooms together. Once you’ve determined the date and cruise line, choosing where to go will be easier. Throw in budget constraints and you may have only one or two choices. The Caribbean is the most popular family destination; Alaska is a close second. Also, think about where reunion members are coming from. Airfare to and from the embarkation point will increase overall price. The majority of eastern and western Caribbean cruises leave from Fort Lauderdale and Miami, Florida, or Galveston, Texas. 6. Work with one travel agent. Work with a travel agent to get the best group rates, book public rooms for family events and reserve a block of rooms together. Share the agent’s contact information with members, and have them book cabins and airfare with the same agent. Using one agent helps ensure discounts and special amenities. 7. Sort out cabins and dinner seatings early. To maximize time together, book your cabins in a block and/or plan to eat dinner together. Your travel agent may be able to reserve a block of rooms, if you are planning in advance and everyone wants the same kind of cabin. Dinner seatings can be a surprisingly volatile issue. Families with young children, and older generations typically vote for early seating. Others prefer later. Make a decision based on what group outnumbers the other. A nice compromise is meeting in a lounge for a before/after dinner drink. 8. Plan organized activities and down time. Here is where cruise reunions really shine. A cruise offers plenty for the energetic. Those feeling overwhelmed by togetherness can easily slip off to their stateroom or to the spa. Plan activities at the beginning of the trip for members to bond and reestablish relationships. During the rest of your trip, they’ll interact and have spontaneous get-togethers. 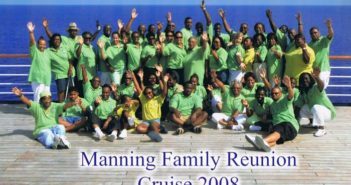 The standard Royal Caribbean Royal Reunions package is for groups of eight or more. For an additional $50 per person the standard package includes stateroom door decorations, a welcome aboard letter from the captain, Royal Reunions logo gift (visors or tote bags), a group photo for each member and a personalized farewell cake. The Elite Reunions package (an additional $100 per person) adds organized group activities run by the ship’s cruise staff. 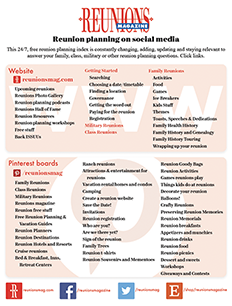 Members compete against each other in a special scavenger hunt, and see who knows the most about other reunion members with a customized Reunion Trivia Challenge. 9. Plan small as well as large get-togethers. In addition to events for the entire family, create get-togethers for everyone in the grandparent’s generation, another for the parent’s generation and another for younger cousins. Kids get together in onboard kids’ programs and it’s a good idea for little family members to interact. After all, they will one day be the ones planning reunions. “We’ve set up rooms with piñatas and balloons for kids’ birthday parties, anniversary party receptions, or hobbies — one room was set up for scrapbookers,” says Larsen. It’s all too easy for the person organizing the reunion to get so caught up in details that you forget to have a good time. Make lists, rely on your travel agent, delegate, double- check, triple-check, then, once you’re onboard, relax and have fun. If something goes wrong, don’t take it personally. If you keep your sense of humor, mishaps may well become “cherished memories” told at future reunions. If you are relaxed and having fun, chances are your family will too. Lisa Anderson Mann is a freelance tratakvel writer based in Northern California. She believes passionately that you can never have too much family or too many vacations.